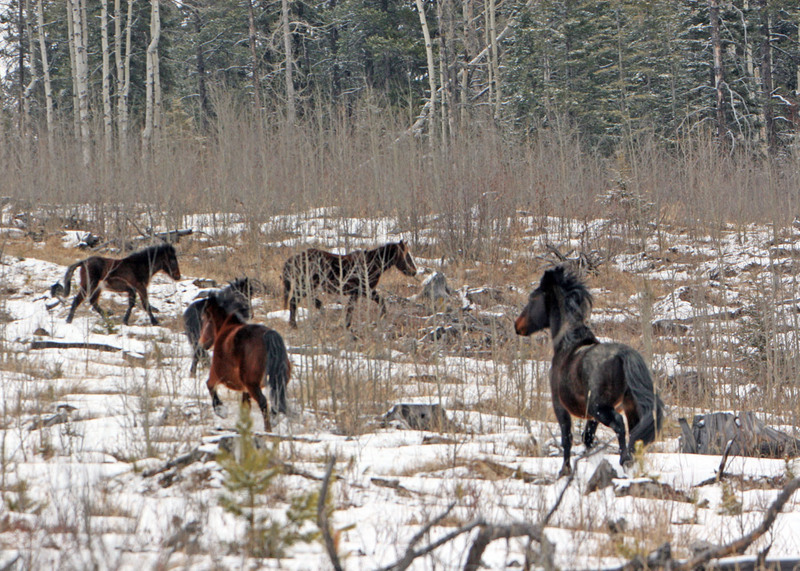 I took a drive west this past Sunday to check on some of the wild horses and to take my lovable dogs for a run also. It was snowing again when I left Olds and continued to snow most of the day. On my way along a back road I spotted a pair of bald eagles sitting high up in some aspen trees. Feathers fluffed up against the snow and cold, they too looked so happy with the weather. Soon though they will leave this, their wintering range, to migrate further to the west and north. 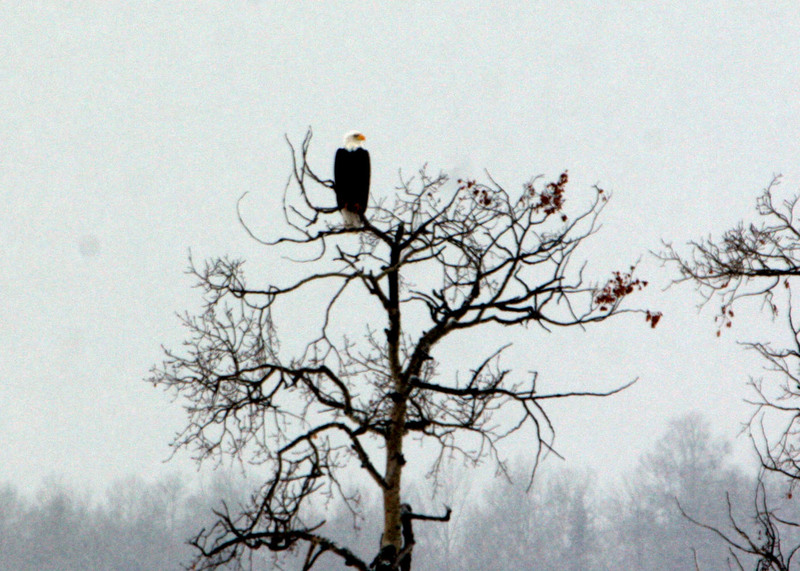 Seeing an eagle to me is always a sign that a good spirit will be with me that day. 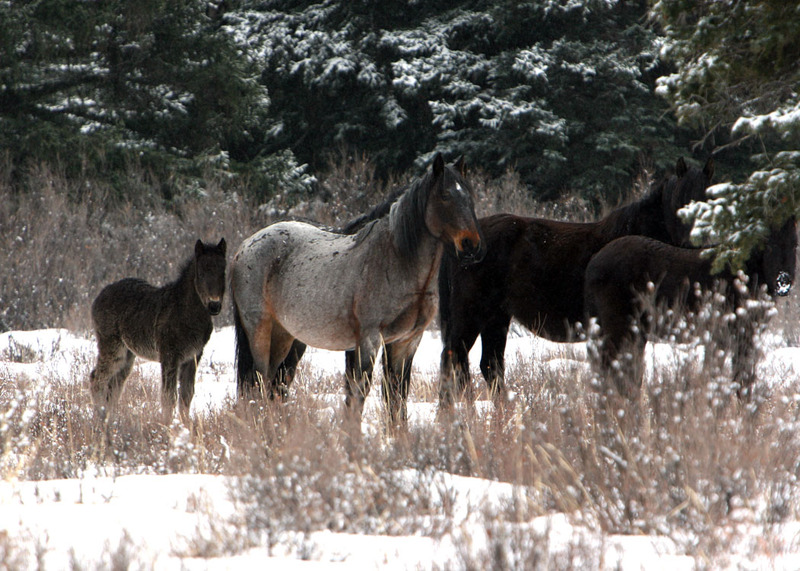 The day was to offer me several surprises as I toured into different areas checking on the herds of horses I knew about. 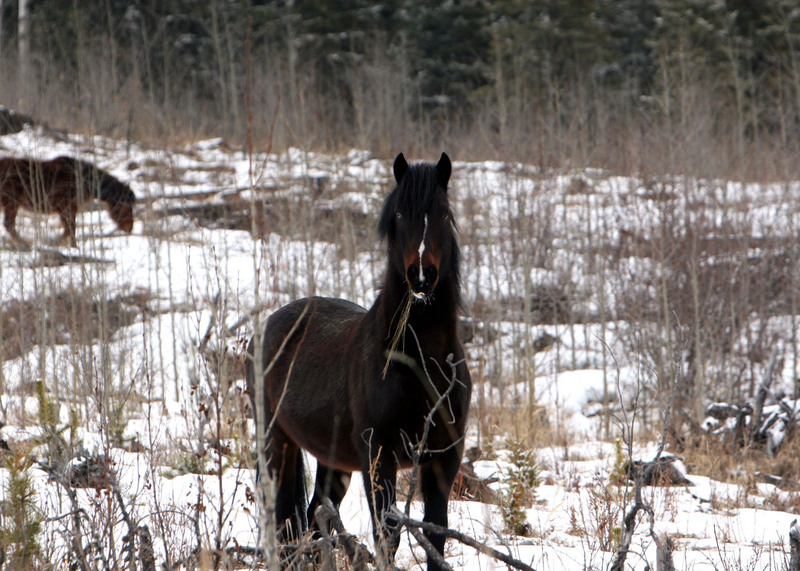 After spotting several moose and deer, I started to come across the horses. All are looking so very healthy for this time of the year. I then came across one of my favorite herds and stopped to take pictures. As I moved out into the herd, two of the young studs decided to engage in some scuffles. I started to take pictures when two more of them decided to square off against each other also. This is not unusual for March. 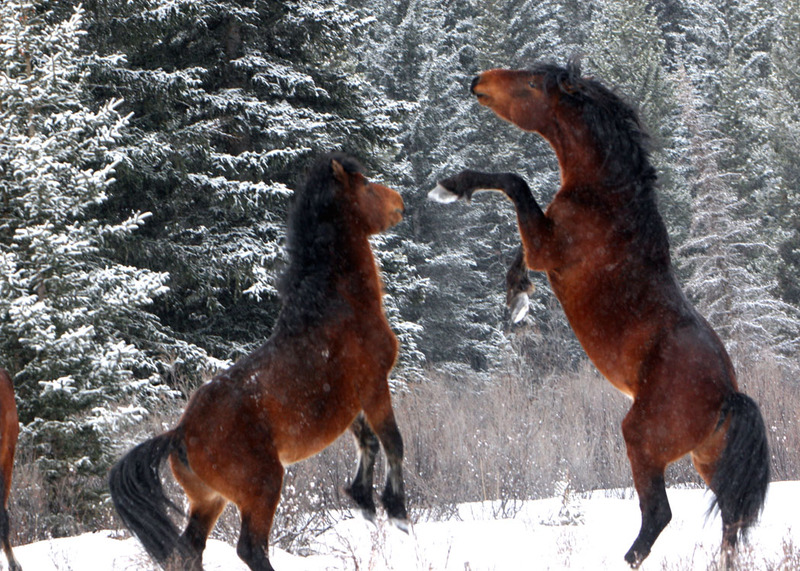 It is at this time of the year the younger studs prepare themselves by honing their fighting techniques, in order to eventually challenge a herd stallion for a mare or two. I was in awe as I stood between the two pairs of combatants and trying to take as many pictures as I could. I was too close for my big lens and fumbled quickly for a lens change. I got some fantastic fight sequences and sometimes I wish I also had a video camera sometimes, to capture the sounds the studs make when fighting. It does get the heart racing in excitement at this raw and rugged jousting for superiority. 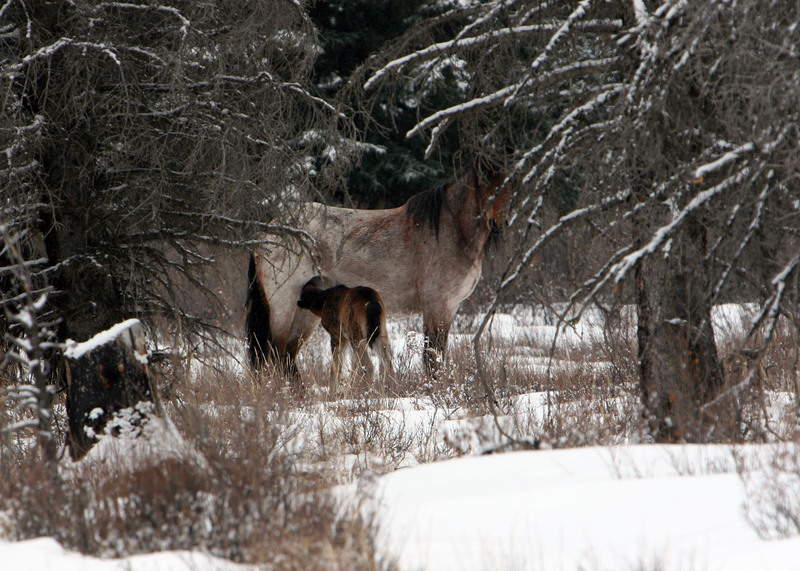 I then visited two other small herds before heading to check on the Wild Horse Creek herd and the young filly that was born in January. I had named it “”Yepa”, (Snow Girl) and I named it’s mare, the red roan, “Shappa”, (Red Thunder). I spotted them right away when I got into the area. Leaving the dogs in the vehicle I slowly moved in on foot. They are getting used to me and are not quite as nervous, which allowed me to get quite close before the herd stallion “Raven” gave me a warning. 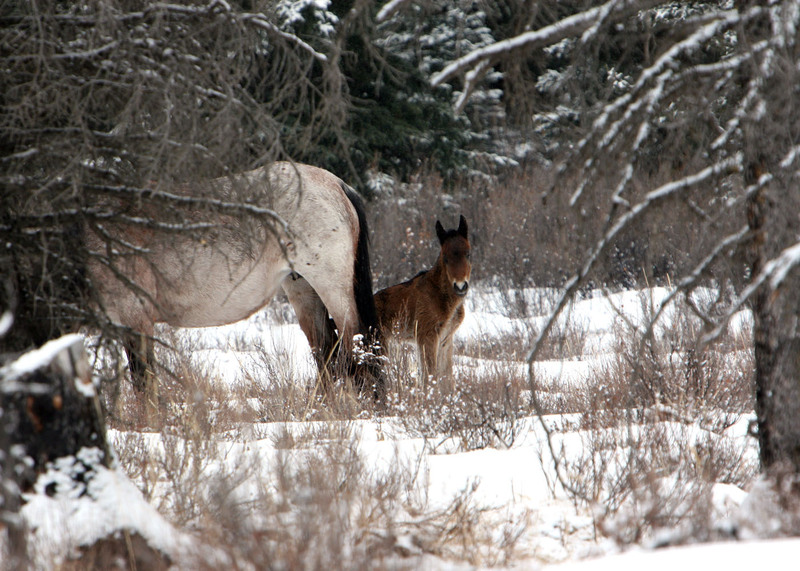 As I took pictures I wondered where the other roan mare was, as she was not with the rest of the herd. Then off toward the other end of the clearing I saw her standing next to the trees. Something did not look quite right and when I raised up my camera and zoomed in, I was totally amazed. 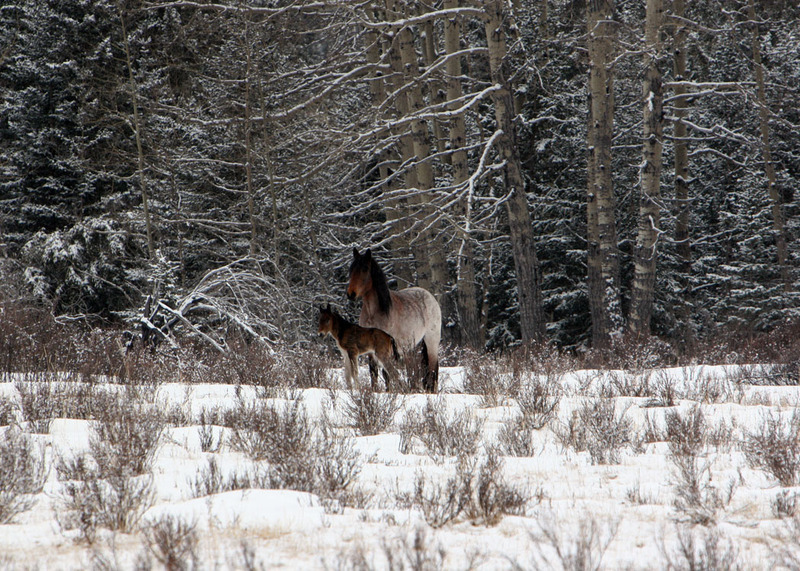 There with her was another young foal, less than two days old. As I started take all sorts of different photographs, I was blessed with another wonderful experience, as the mare then brought her new offspring toward me. 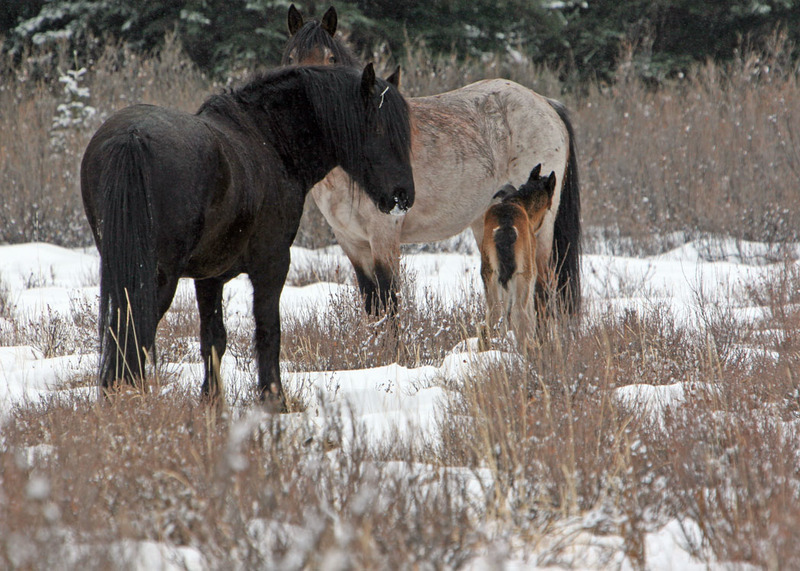 Very seldom will the wild horses allow a human to be so close to the foals. It seemed to me, that she brought it in close for me to admire her beautiful new son. The eagles had indeed been right and when I looked high up in the sky to the west, there were two golden eagles soaring on the mountain updrafts. I cannot describe how joyous I was feeling inside. Then even Shappa and Yepa along with Raven and the rest of the herd came in closer. Oh wow!!!!! The herd watched as “Snowstorm” drank mom’s warm milk. A couple of the younger herd mares also came over to check on the new one, sniffing noses with it and licking the milk from it’s face. It was cute to me, when after finishing another drink of milk the foal looked up and suddenly saw me, such a strange creature. It stood staring for a short time at me with those beautiful eyes. Then Raven approached and checked out his new offspring and it was touching as he murmered very softly at it. At that point, being on a natural high, I left the herd in peace, expressing my gratitude as I walked or you could say floated back to my vehicle. I checked on a few other herds that day also. With one herd I saw on a hillside, I approached on foot and was so busy concentrating on two of the mares, that as I topped the rise I was suddenly confronted by the stallion. He was only 20′ away and was just as surprised as I was. He stomped his hoofs, threw his head as he snorted a warning before racing off, with his herd. Holy smokes, where did you come from. I was to get one more surprise that day before I headed home. 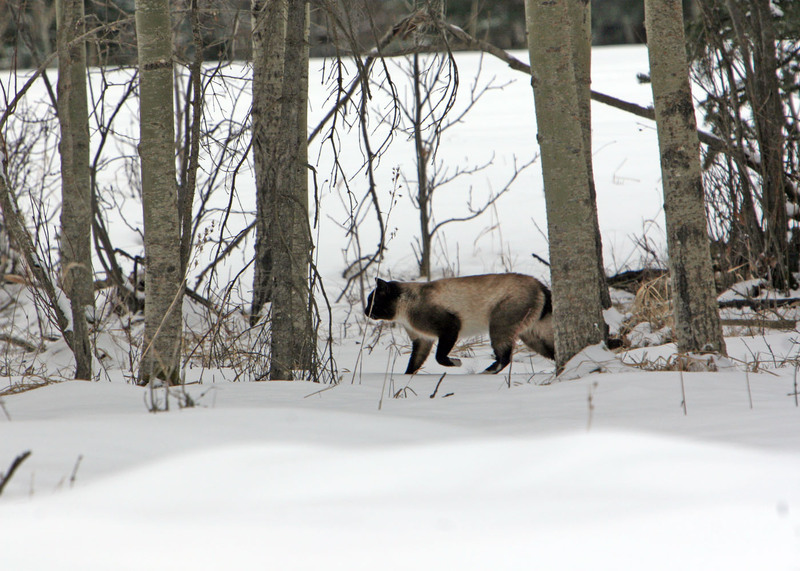 Far back in the forestry, I saw something walking in the trees and at first thought it might be a wolverine or something. By the time I stopped though, I could see it was a siamese cat. I could not leave it out there I thought, but was also unsure how it would react with my dogs in the vehicle too. I had to try though and as I walked toward it calling, it hissed as it arched it’s back and took off at the run. It probably got away from somebody camping and has somehow survived this winter also. "I thought I saw a puddy cat"
One last note, Global Televisions 16:9 The bigger Picture will be airing a segment they filmed on our wild horses. It will be on the air on Saturday, March 26 at 7:00 PM on your local Global station.